Living in the 21st century and wondering if two foreign languages, piano lessons and ballet is enough for your little daughter – if it is too much or if you could add something more just to make sure that she will have the best supplies for her future – you often forget that this is not the stereotype description of a kid’s life nowadays. On the contrary, we in the western world often live in an illusion regarding kids, and ironically it was Hollywood that most recently reminded us about the destiny of kids around the world. And turning the irony into a real drama was the gossip magazines that followed the life of the child actors in India. They really slapped us in the face. Of course I’m talking about child labour and of course we can ignore its existence, despite the fact that we wear clothes made from child workers in India, Pakistan, and Indonesia. We eat food collected from child workers in Africa and we decorate our houses with things made by child workers somewhere in South America. Do you know what the worst is? That we have created stereotypes and prejudices even when it comes to child labour, conveniently putting them working in far away Asian countries and questionable African states. We conveniently miss the child next door, yes in our wonderful, democratic and caretaking western states. Have you ever wondered about the little boy who helps in the small restaurant? What the hell is he doing there? He’s not a cute little boy that helps his dad, but he is a child that should be at home doing his homework or playing. Not saving dad some money, because that’s exactly what he’s doing. How many times haven’t we walked around in wonderful little markets in the European neighbourhoods and seen young boys and girls helping during the hot days of summer or the cold days of winter? What about the touristic places in Europe; in Italy, Greece and Spain? Why don’t we consider that child labour? Why do we close our eyes and when we talk about child labour, the faces are always from India, somewhere in South Asia or Africa? Our arrogance and prejudice to all that makes the use of kids easier, but we don’t realize this because we have created thousands of excuses. And please don’t tell me about financial difficulties, the recession and small business survival difficulties, because that only makes it worse. Indian parents, who use their children as workers, have exactly the same excuses and in their case it is a case of survival, because everybody in the family has to work. Still we can be critical of them but not of ourselves. 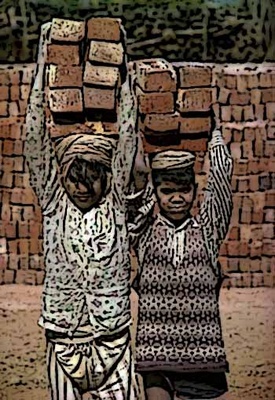 According to UNICEF, 158 million children between the ages of 5 and 14 are in child labour. This means that one in six kids in the world works hard every day for a few pennies, or for a plate of food that most likely doesn’t even include the basic. These kids are everywhere, they are not only in South Asia and Africa, and they are everywhere, all around you, they are just …invisible. And they are invisible because we want them to be invisible, it is convenient for our conscience and we have created prejudice myths to cover up this unbelievable crime that happens next door. I have heard people using this phrase too many times – isn’t our future dying working, or dying from lack of water? Does this sound dramatic? Well, it doesn’t matter, the reality is dramatic! 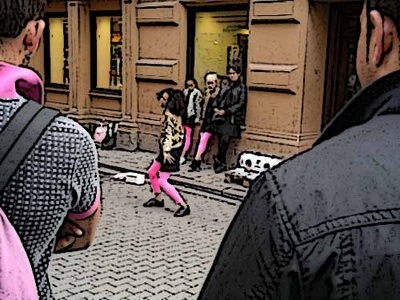 When you see a little girl dancing or singing in the street for some pennies, please don’t just think that she’s cute, remember that she’s working hard. The same goes for the 12-year-old who baby-sits – what an enormous responsibility for a young kid – and the little boy in the local inn that brings you the glass of water. What can change all of this? How ironic to be asking this, only days after our European Parliament elections. Well, the MEPs can make a difference, by making sure that they make the rules, and that the states make those rules work. The first weapon is education, and the laws are already there – but nobody is really enforcing them. Then the responsibility comes to the people, and don’t worry, we have our share. We have our share since the night we wanted to go to the theatre and asked the neighbour’s 12-year-old to babysit! We can stop child labour, starting from our own house, our own neighbourhood and our own country.